Roles are predefined sets of permissions. When you assign a role to a user, you can be sure that the user will be able to access only that information within the system which is necessary for them to do their work. Usually roles are created based on the user’s job functions: sales manager, marketing team member, administrator. But this is not a strict rule. You can create as many roles as required and configure them according to the needs of your company. For how to create a role, see the Create a Role section of the Actions with Roles guide. Permissions to perform a certain action on entity. For each permission of this type you can specify a desired access level. Permissions to access system functionalities. They are also called ‘capabilities’ on the interface. System functionalities belong to the system and thus for them you simply specify whether to include permissions to access them into the role or not. View A user can see the entity records in the grid and open their view pages. Share A user can share an entity record with other users. This action is available only in OroCRM EE. 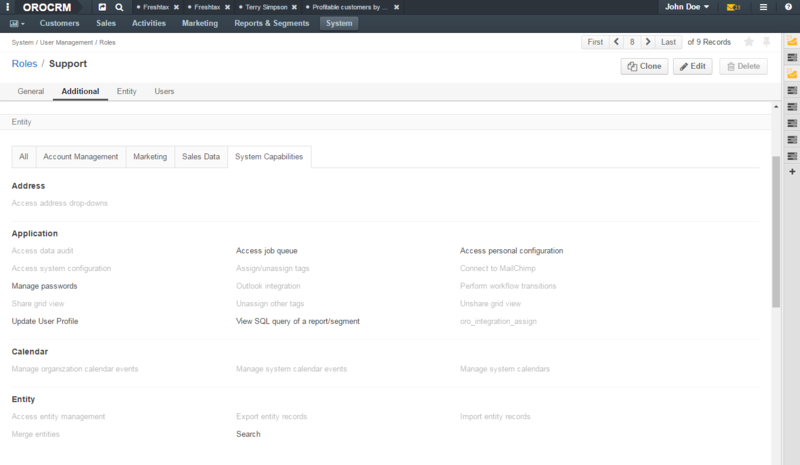 Configure A user can set up the system configuration for themselves and other users. This action is available on for the User entity. 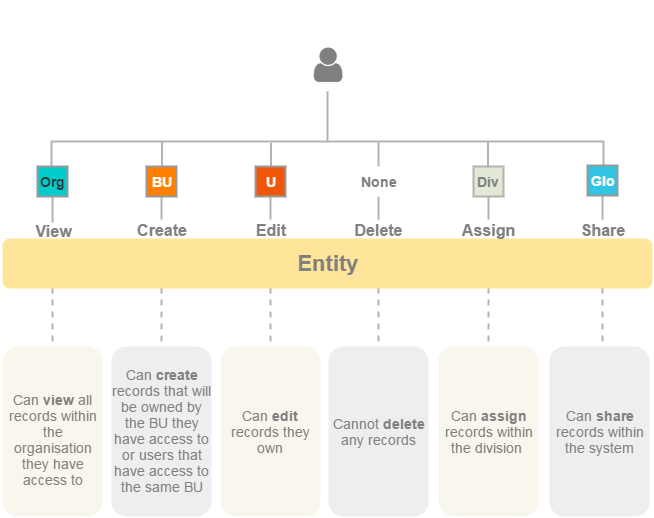 For each of this actions you can set an access level, thus defining the range of entity records a user can perform an action on: will these be only the records owned by the user themselves, records of the user’s division, all records in the system, etc.? For more information about which access levels defines which range, see the Access Levels guide. Note that the set of available access levels depends on the entity’s ownership type. For example, you will not be able to set the User access level if the entity’s ownership type is Organization. Only two access levels are always available: None—access is denied and Global—access all entity records within the system. Permissions of this type either define whether a user must have access to certain parts of the system (e.g., should they see the page with system jobs queue) or extend ‘action on entity’ permissions (e.g. should a user retain the ability to modify their own user profile if editing of user profiles in general is forbidden for them). Permissions of this type are also called ‘capabilities.’’ Capabilities can be either enabled or disabled for a role. Each OroCRM user must be assigned a role. A user can have several roles. This is a logical approach if we assume that roles may be based on job functions. For example, if you have roles ‘Leads Development Representative’ and ‘Sales Representative’ and some employees do both of these jobs, you simply assign them both roles instead of creating a specialized role that will cover the whole range of required permissions. For how to assign a role to a user, see the Assign Roles While Creating a New User section. If a user has two or more roles with different permissions, in the result the user will have the maximum of rights granted by all of them. All important information that comprises an entity is contained in the entity fields. For example, if you open any record of the Business Unit entity, you will see such fields as Name, Organization, Description, Website, etc. When you include the permission to view entity records in a role, users with such role are automatically able to see all fields of the entity. However, there are situations when it is desirable to hide certain fields from one group of users while still having them available for others. For example, both the sales team and support team require to see Opportunity entity records. But as the financial information is often considered sensitive, you may want to hide the Budget Amount field from the support team members. Is is possible to do this using Field Level ACL functionality. When you enable it for an entity, you can assign permissions that allow actions on a particular entity field to a role. For more information about the field level ACLs, see the Permissions for an Entity Field (Field Level ACLs) guide.